Brian & Andrea Sax – Can you make money with ACN? Brian Sax knew he had to make some changes and with a quickness. Even though he was a graduate of Princeton University with an engineering degree, he was miserable. He was working 70 hours and week, and he felt unfulfilled. You would think with a degree from an Ivy League university, he would be happy for the rest of his life. He didn’t want to be stuck in front of a computer monitor, day in and day out. He wanted a career where he earned enough income to decide how he could spend 70 hours doing whatever he wanted, not the other way around. Brian was introduced to ACN by a friend, and says that within 10 minutes of hearing about the company, he knew it was where he wanted to be. Ten years later, he tells his life-changing testimony to direct selling marketers and wannabes worldwide. He, along with his wife Andrea, travel around the world, experiencing different cultures and foods, and spreading the benefits of becoming an ACN consultant. Not bad for someone who makes $120,000.00 a month in residual income. And he does it by traveling and meeting people from every corner of the globe. I bet he is really glad he made the decision to leave a corporate job and create a career for himself. Brian doesn’t do it alone. He has a team of skilled leaders to make connections in places such as Latin America, changing their lives into a success story unlike his own. Brian is adamant about give 110% to anyone who is willing to put the work in. Who is Brian Sax in ACN? Before joining the ACN multi-level marketing business, he had no experience in the network marketing industry. As a college student at Princeton, he studied civil, geological, and environmental engineering. In addition to his studies, he was an accomplished athlete on the track team. In 1994, while a senior, he led the team to two conference championships. The team also enjoyed a brief rank as the #1 NCAA Division I indoor track and field team (dual meet rankings). Brian is a truly ambitious person. After joining ACN, Brian set high goals for himself, and in 2000, he earned the RVP position. 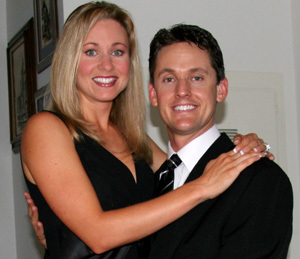 In 2003, Brian met Andrea, his future wife. They married in 2004, and the couple moved to Australia where their two children, Tiffany and Brayton were born. Today, the couple lives in Los Angeles, California. Another important event took place for Brian in 2003. He became the first person to ever earn the title of ACN North American Senior Vice President. He also serves on the President’s Council, as well as being a member of the Circle of Champions. This is the highest leadership group in ACN. Natural leaders (which is why they are probably top MLM earners), Brian & Andrea Sax are credited with being involved with the launching ACN overseas in Australia, New Zealand, and Poland. Today, the couple continues to provide exceptional training and mentoring as they lead their team. Their devotion to helping others achieve financial and time freedom is the real mark of true leadership. What an inspirational and motivational couple! I mean, here you have a man who has a degree from Princeton, so you know he could have had his pick of any position with any company, anywhere. But he didn’t want that type of life, sitting at a desk, attending meetings left and right. He knew there was more to life than just having a degree from one of the best universities in the world. When he thought of having a family, is that the legacy he wanted to leave for his children? Get a job that gives you the money you want, but has you stressful and unhappy on a daily basis? You want more information on ACN? Then let me tell you about this innovative MLM business. Established in North Carolina in 1993, ACN multi-level marketing business provides energy, telecommunications, and other services through independent distributors. At first, ACN operated as American Communications Network only in the U.S. Today, you can find ACN in 24 countries. To showcase its foreign partnership, the name changed to ACN. Over the years, ACN has gained notoriety and was listed on Inc. Magazine’s 1998 500 list as one of the fastest growing companies (#22) in America. For a moment, ACN got out of the energy reselling market, but is now back in. If you are interested in becoming an independent distributor, it is important to know that you will be selling the telecommunication service, but the order fulfillment is done by the brand-name providers. ACN works with a lot of big names like, Verizon, AT&T, Comcast, DIRECTV, and Sprint. It is no surprise that Brian & Andrea Sax are so successful. They are providing customers with services that they use every day, and those services are from some of the best names in the telecommunications industry. Customers are not forced to purchase products that may or may not work for them. They are buying services that they want and desire. With the telecommunications industry growing and changing on a daily basis, everybody owns and needs a cellphone and internet. You will be hard pressed to find a person on earth who doesn’t have a mobile. As far as internet, people can’t live without Facebook, Instagram, and Twitter. Simply put, you don’t have to convince people to buy energy, phone, or internet service. For you, the IBO, ACN boasts that there is unlimited potential to your earning capability. The four co-founders of ACN (Robert Stevanovski, Mike Cupisz, Tony Cupisz, and Greg Provenzano) developed this company because they were dissatisfied with the direct selling businesses and the opportunities for growth they had encountered themselves in the industry. The foundation of ACN are principles such as integrity, solid business ethics, and to always put the needs of their IBOs and customers above all else. I didn’t know this but ACN is the world’s leading direct seller of telecommunications, energy, and other necessary services. This is all thanks to the hard work of independent business owners like Brian Sax, Art Napolitano, Mike Masser, and Franco LaFranco, who have become a part of the ACN family. People who wanted to become entrepreneurs and did so, very successfully, I might add! I surely enjoy a success story. There were no guarantees that their business was going to flourish. But like Brian Sax did, he took a chance, and it paid off. ACN Compensation Plan works similar to compensation plans of other MLM businesses. As an independent distributor, you earn residual income for every customer you sign up, and that stays with ACN. If you recruit others to coming into the ACN fold, you earn bonus money as well. Also, every time your customer adds a service, you earn a bonus. As an IBO, you just direct customers to the online store, and let them choose the services they want. You can make a very nice living with ACN. All you have to do is operate with honesty, have strong ethics, and perform under a plan that complies with consumer protection laws. ACN states that reputation is everything. ACN’s belief is that consumers shouldn’t have to pay a gazillion dollars for reliable, high-quality services. Furthermore, it shouldn’t be difficult for IBOs to become top earners. This is why the goal has always been to keep a business model that is simple to understand and follow. But ACN says that it doesn’t do business the way it does for recognition. The company functions the way it does because the more people it helps, the more lives that are improved, the better. ACN also provides support for many charitable organizations. The company is a Ronald McDonald House Signature Partner and every year, the company hosts a celebrity golf tournament. All the proceeds go to the Ronald McDonald House in Charlotte. ACN says it is important to give to the independent contributors and the customers, but also to give back to the community. This is how the idea for Global Reach Charities was established. The company also created the ACN Project Feeding Kids program. Every time a customer purchases a service, a child is fed. ACN’s goal is to provide more than 1.5 million meals. Brian & Andrea Sax must have been on to something when they signed up with ACN. Because of their success, Brian & Andrea Sax can take more time to spend with their children and to expand their family without having to worry about feeding another mouth. Brian can also get back to participating in track & field, while Andrea is now more focused on creating her own home business.